In today's blog we take a look at the performance of the JSE All Share Index and that of the largest listed stock on the Johannesburg Stock Exchange (JSE), Naspers (NPN). Naspers is so big right now that if it moves, it moves the market with it. The graphic below shows the return provided by the JSE All Share and that of Naspers over time. Naspers sneezes the JSE gets a cold. The comparison graphic below shows the performance of the JSE and Naspers. As users change the dates so will the return be recalculated for both. The interactive chart clearly shows that Naspers' performance far outstrips that of the All Share Index over the last 4 years, but when zooming in a little more to shorter time spans such as the last month, one can see that the movement in terms of trend (not veracity) is very similar, as the image below shows. The image below shows the share price movements of Naspers and the JSE All Share Index over the last month. 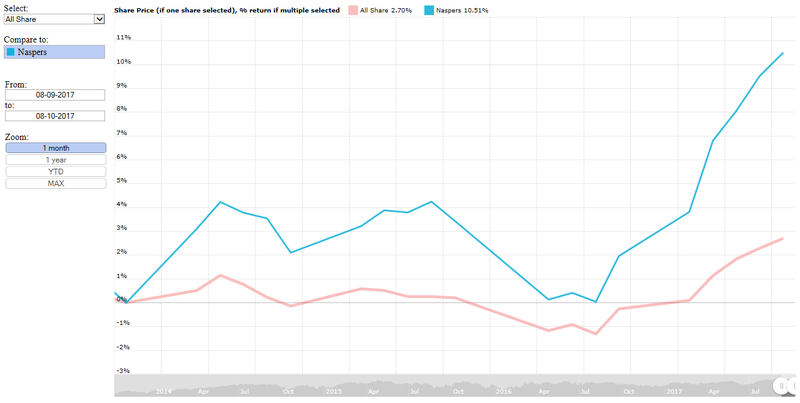 While the overall percentage gain of the JSE All Share is far lower than that of Naspers, the general direction they are both heading in are very similar. And this is thanks to the substantial weight that Naspers carries in the JSE Top 40 index.